i don't like leftovers. i don't like having them, eating them, or serving them. they take up space in my fridge and taunt me daily because i won't open them or serve them, until finally i have to throw them out or give them to the dog, and then i feel so guilty for wasting otherwise perfectly good food. it's not like we have a ton of leftovers. i have almost perfected cooking to our portion sizes, but by the end of the week we end up with enough mix-and-match to make a meal for each of us. this week, for the first time, i am including leftovers in my menu plan. why does it feel like i'm cheating? well, i'll see how it goes this week. who knows. maybe it'll feel great to set out the remains as a buffet of choices. maybe it'll be so unappealing we'll end up ordering Chili's togo. 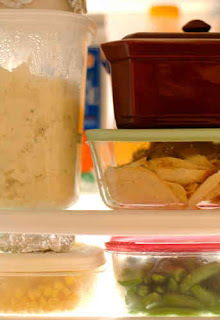 i scheduled leftovers for Sunday for 3 reasons 1) obviously we have more leftovers on Sunday than we would on any other day of the week, 2) good day to clean out the fridge, and 3) we usually go out for a late lunch after church and no one is really starving come dinner time. i am most excited about the Organic Rice Pilaf that we picked up on our Costco trip yesterday. it's a huge canister for $8.99 that will probably last us at least 2 months. we really like rice pilaf- all 4 of us. i secretly plan on making extra so that there is leftover rice pilaf on Sunday. for more menu's and menu planning visit the most organized host of Menu Planning Monday at I'm an Organizing Junkie.